MEMOTAIN® offers the best fit and maximum user comfort. By using state-of-the-art technology, we are in a position to manufacture lingual retainers made of Nitinol©. Digital planning and design processes ensure that our retainers can be tailored precisely to meet the individual requirements of every patient. Thanks to the patented CAD/CAM manufacturing process, MEMOTAIN® retainers are more precise than a handcrafted lingual retainer could ever be. It is possible to create even the smallest designs without bending the alloy. This ensures lower risk of damage or fracture of the material. Thanks to the specifically tailored transfer coping, fitting the retainer is child's play. MEMOTAIN® retainers ensure accurate positioning, especially in connection with the upper and lower jaw, and thus allow greater long-term wear comfort and reduce the risk of biting off the device. Moreover, the long-term, compliance-independent stabilisation of the position of the teeth results in fewer incidents of undesired tooth movement and consequently fewer follow-up treatment appointments. Maximum convenience for you and maximum comfort for your patients. CA DIGITAL's retainers are made using computer-aided design (CAD) and computer-aided manufacturing (CAM) processes. Thanks to the innovative, patent-pending manufacturing process, MEMOTAIN® is made to fit and, with a thickness of 0.4 mm x 0.4 mm, is much thinner than conventional lingual retainers. Nitinol©, the shape-memory alloy: Thanks to CA DIGITAL's innovative manufacturing process, it is possible to design the minutest details with the amazing material called Nitinol©. Once it is brought to shape, this innovative memory alloy cannot be bent any more. Furthermore, the pseudoelastic properties of this material ensure that the natural, physiological tooth movement is restricted as little as possible. Thanks to the innovative manufacturing process, MEMOTAIN® is made to fit and, with a thickness of 0.4 mm x 0.4 mm, is much thinner than conventional lingual retainers. Once it is brought to shape, this high-grade memory alloy cannot be bent any more. The natural, physiological tooth movement is restricted as little as possible. Thanks to CAD/CAM manufacturing techniques and the use of this state-of-the-art material, it is possible to reproduce even the minutest structures. This ensures the best fit. Thanks to their perfect fit and smaller bonded surfaces, MEMOTAIN® retainers are much easier to clean than conventional steel retainers. MEMOTAIN® retainers are delivered with a customised transfer jig. Fitting them is therefore quite straightforward. Maximum convenience for you and maximum comfort for your patients. WHEN IS THE RIGHT TIME TO ORDER RETAINERS FROM CA DIGITAL? The last check-up appointment before conclusion of the active treatment is also the right time for ordering retainers at CA DIGITAL. It is important to ensure that, between the time of taking the impression or scan and inserting the CAD/CAM retainer, no more movement takes place in the anterior tooth region. The CAD/CAM retainer is precisely fabricated on the basis of the model (or scan) provided by you. The maximum time required for delivery of the CAD/CAM retainer is 9 working days following receipt of the model/s (or scan). HOW LONG DOES IT TAKE FOR THE DELIVERY OF CAD/CAM RETAINERS? The maximum time required for delivery of the CAD/CAM retainer is 9 working days following receipt of the model/s (or scan). WHO IS RESPONSIBLE FOR THE COMPUTER-AIDED DESIGN OF A CAD/CAM RETAINER? The CAD/CAM retainer is designed by a dental technician with several years of professional expertise. I CAN'T SAY IF MY PATIENT'S BITE IS TOO DEEP AND WHETHER HE SHOULD GET AN UPPER JAW RETAINER. WHAT SHOULD I DO? If, after inspecting the models, you are not sure, tick the field "Prepare retainer only after consulting me" in the order form. In such cases, the CA DIGITAL team will present you several options for positioning the retainer. We know from experience: With absolute certainty, we can say in advance whether or not there is enough room for a CAD/CAM retainer. You will never bond a CAD/CAM retainer and determine later that the patient has occlusal contact with the CAD/CAM retainer. A 1.2-2.2-thick CAD/CAM retainer is almost always feasible (even for a very prominent overbite). In general, a 1.3-3.3-thick CAD/CAM retainer is also feasible for a prominent overbite. 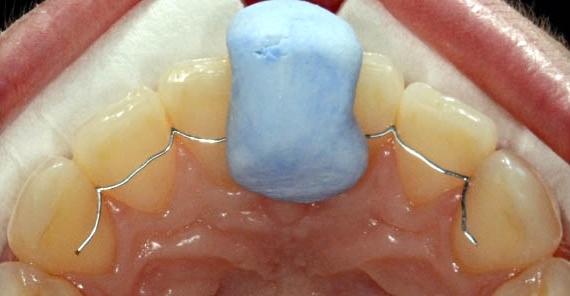 Note that the wire has a thickness of only 0.012" x 0.012" and, thanks to the retainer design by means of 3D software, it is possible to get the ideal fit of the retainer. WHAT MATERIAL IS USED FOR MANUFACTURING CAD/CAM RETAINERS? The CAD/CAM retainer consists of a 0.012" x 0,012" (0.3 mm x 0.3 mm) strong square archwire made of Nitinol©. The CAD/CAM retainer is, however, electropolished prior to delivery. As a result of this post-production treatment, the CAD/CAM retainer shrinks by a few microns (µm). This step is performed to give the retainer a smooth finish and round off the edges. HOW IS IT POSSIBLE TO STABILISE ORTHODONTIC TREATMENT RESULTS? In addition to lingual retainers, which are also referred to as fixed retention appliances or simply fixed retainers, removable appliances are also available as an alternative. Following the active treatment period, removable retainers are to be worn at all times – during the day and at night – in the first few months. After around 3-6 months, the wearing time is reduced and the retainers are to be worn only during the night. Removable retainers can stabilise the position of the teeth as well as fixed retainers, but only if they are worn every night. 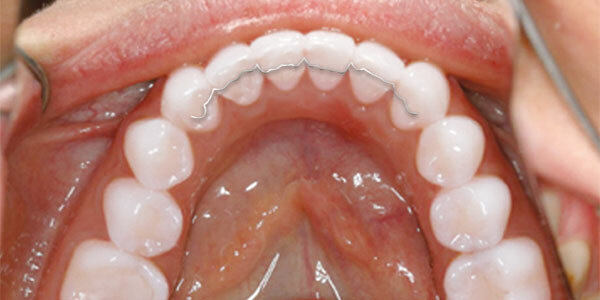 Scientific studies show that, after a period of 5 years, only a very few patients wear their retainers [Pratt MC et al. : Evaluation of retention protocols among members of the American Association of Orthodontists in the United States. Am J Orthod Dentofacial Orthop. 2011 Oct;140(4):520-6]. Other authors insist that, upon completion of active treatment, every patient should be provided with a fixed retainer in order to ensure sufficient prevention against any undesired tooth movement [Durbin DD: Relapse and the Need for Permanent Fixed Retention. J Clin Orthod. 2001 Dec;35(12):723-7]. WHY IS IT IMPORTANT TO STABILISE THE RESULTS IN THE POST-TREATMENT PERIOD? Ensuring the long-term success and stability of the treatment results is a vital to every orthodontic therapy. This is important as teeth have a tendency to return to their original position even after corrective orthodontic treatment. To prevent this from happening, it is essential to ensure that the teeth remain in their post-treatment position. Remember: The longer retention devices are used for stabilising the dental arches, the lower the tendency of the teeth to move back to their original position. FOR HOW LONG MUST THE TEETH BE STABILISED IN THEIR CORRECTED POSITION AFTER THE BRACES HAVE BEEN REMOVED? There is no simple answer to this question. As a general rule: The retention phase should be approximately twice as long as the active treatment period. Thus, if a patient has worn fixed braces for a period of two years, then a retention device should be used for a period of four years to stabilise the treatment results. The propensity for recurrence, however, varies depending on the different types of malocclusion and temporomandibular disorders. Owing to this, therefore, there is no hard-and-fast rule. The trend in modern orthodontics is to focus on the so-called "life-long retention" principle, i.e. to aim at the life-long stabilisation of the treatment outcome. To ensure that the teeth remain stable in their corrected position for an entire lifetime, it is also necessary to ensure the life-long stabilisation of this position. Life-long retention can also be beneficial, irrespective of the likelihood of an orthodontic relapse. Among many patients, we observe crowding in the anterior region, so-called "tertiary crowding" (also known as "late crowding", "post-adolescent crowding" or "late incisor crowding"), during the patient's lifetime. This occurs more frequently in the lower than in the upper jaw. This kind of crowding is so common that Professor Fastlicht describes "tertiary crowding" as an "anatomical/physiological phenomenon". ... AND CAN BE ABSOLUTELY SURE THAT MY TEETH WILL NOT MOVE AGAIN? Unfortunately not! Tooth movement can occur throughout one's lifetime. In most cases, orthodontic relapse is almost unlikely after a sufficient retention period. Nonetheless, it is possible that teeth can move out of position again. During their lifetime, humans are generally prone to crowding in the anterior tooth region (after the process of permanent dentition is completed). This initially occurs in the lower jaw but can also extend to the anterior region of the upper jaw. The technical term for this phenomenon is "tertiary crowding". Wearing a retention device prevents both an orthodontic relapse as well as undesired tooth movement. WHEN IS TREATMENT WITH CAD/CAM RETAINERS ADVISABLE? WHAT IS THE CORRECT BONDING PROCEDURE FOR MEMOTAIN? Bonding instructions are provided in the PDF file. MEMOTAIN IS MADE OF NICKEL? WHAT ABOUT PATIENTS WHO SUFFER FROM A NICKEL ALLERGY? Since the 1970s, orthodontists have been using nitinol (an alloy of nickel and titanium) for intra-oral treatment. Furthermore, this material is also used in the production of stents. Thanks to its outstanding biocompatibility and corrosion resistance, nitinol is the ideal material for meeting the highest demands in orthodontics. Surface finish and coating are important factors that influence biocompatibility and corrosion resistance. MEMOTAIN retainers are prepared according to similar processes as those used stent production. As a result, they possess an extremely smooth surface and antibacterial properties. The induction of an allergic reaction following the intra-oral application of nitinol can be virtually ruled out. Studies show that patients suffering from a "nickel allergy" did not display symptoms of an anaphylactic reaction following oral exposure to nitinol. That is because the suspected "nickel allergy" is actually caused by an allergic response to nickel sulphide. Nickel sulphide can only originate if nickel reacts with sulphur. This happens regularly when, for instance, the nickel in designer jewellery reacts with human sweat to form nickel sulphide. Fortunately, there are no sweat glands or other sources of sulphur in our oral cavity and hence there is no formation of nickel sulphide that can cause an allergic reaction. Nitinol is thus a safe material which makes it suitable for its application in MEMOTAIN retainers. Nonetheless, there are isolated cases in medical literature that report about "nickel allergies" triggered by nickel in oral applications. Until now, there is no scientific explanation for these individual cases. IS IT POSSIBLE TO TAKE AN IMPRESSION IF THE PATIENT IS STILL WEARING FIXED BRACES? Yes, but only if the brackets are in a buccal and not a labial position. WHICH ADHESIVE SHOULD I USE FOR BONDING? For cementing a MEMOTAIN® retainer, composites with either a high or low filler content can be used. Make sure that the transition from the bonding point to the natural tooth is as smooth as possible. These composites ensure a smooth surface that is comfortable for the patient. Compared with flow composites, the higher filler content of such resins makes it more resistant to abrasion. At the same time, however, the sensation of a resin with a higher filler content is rougher for the tongue. The sensation of roughness can be reduced by subsequent coating with a bonding agent. When the photos were taken, the treatment plan for the patient included wearing a removable retention device for the upper jaw at night (which she definitely wanted to discontinue) and a so-called 2-point retainer for the lower jaw – to be more precise: a 0.032" wire attached to the canines. The patient did notice a minimum movement of teeth 31 and 41. The main reason for her insisting on a CAD/CAM retainer was, however, her desire for a greater comfort level. Trial fitting of the CAD/CAM retainer on the plaster model without the silicone transfer coping included in the scope of delivery. Perfect fit – 100% passive. Thanks to their perfect fit, CAD/CAM retainers can easily be placed in the ideal position in the patient's mouth even without the transfer coping that is included in the scope of delivery. 0.3 mm x 0.3 mm or 0.012" x 0.012" nitinol, electropolished. Trial fitting of the CAD/CAM retainer in the patient's mouth without the silicone transfer coping included in the scope of delivery. Perfect fit – 100% passive. Thanks to their perfect fit, CAD/CAM retainers can easily be placed in the ideal position in the patient's mouth even without the transfer coping that is included in the scope of delivery. 0.3 mm x 0.3 mm or 0.012" x 0.012" nitinol, electropolished. 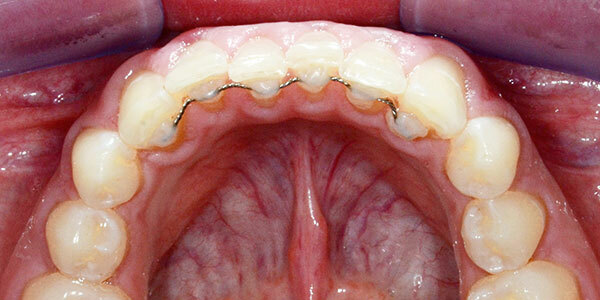 The patient cannot feel the CAD/CAM retainer in the interdental spaces between the teeth. The patient can feel the resin of the bonding surface with her tongue. Perfect fit – 100% passive. 0.3 mm x 0.3 mm or 0.012" x 0.012" nitinol, electropolished. Trial fitting of the CAD/CAM retainer on the plaster model with the silicone transfer coping included in the scope of delivery. Perfect fit – 100% passive. Thanks to their perfect fit, CAD/CAM retainers can easily be placed in the ideal position in the patient's mouth even without the transfer coping that is included in the scope of delivery. 0.3 mm x 0.3 mm or 0.012" x 0.012" nitinol, electropolished. Trial fitting of the CAD/CAM retainer in the patient's mouth with the silicone transfer coping included in the scope of delivery. Perfect fit – 100% passive. Thanks to their perfect fit, CAD/CAM retainers can easily be placed in the ideal position in the patient's mouth even without the transfer coping that is included in the scope of delivery. 0.3 mm x 0.3 mm or 0.012" x 0.012" nitinol, electropolished. In-situ image of the CAD/CAM retainer after bonding to tooth 23 by means of the transfer coping included in the scope of delivery. Perfect fit – 100% passive. Thanks to their perfect fit, CAD/CAM retainers can easily be placed in the ideal position in the patient's mouth even without the transfer coping that is included in the scope of delivery. 0.3 mm x 0.3 mm or 0.012" x 0.012" nitinol, electropolished. 1 – A SLIGHT RELAPSE HAS BEEN IDENTFIED IN THE LOWER JAW AS THE PATIENT DID NOT WEAR THE REMOVABLE RETENTION DEVICE FOR THE PRESCRIBED PERIOD. The patient did not wish to have the position of the front teeth in the lower jaw corrected again. Instead she wanted a permanent stabilisation of the position of the teeth shown in the photos and to discontinue wearing the removable retention device. The patient decided in favour of a CAD/CAM retainer for the lower jaw and a bite splint for the upper jaw. Trial fitting of the CAD/CAM retainer in situ without the silicone transfer coping included in the scope of delivery. Perfect fit – 100% passive. Thanks to their perfect fit, CAD/CAM retainers can easily be placed in the ideal position in the patient's mouth even without the transfer coping that is included in the scope of delivery. 0.3 mm x 0.3 mm or 0.012" x 0.012" nitinol, electropolished. The patient (a student of dentistry) was aware of the progressive crowding of the front teeth of the lower jaw and wanted to prevent this process once and for all with the help of a CAD/CAM retainer. Unfortunately, the patient did not wish to correct the position of the teeth. The patient did not wish to have the position of the front teeth in the lower jaw corrected again. Instead she wanted a permanent stabilisation of the current position of her teeth by using a CAD/CAM retainer to stop the progress of any undesired tooth movement. Slight mesial rotation of teeth 31 and 41 indicating the initial phase of tertiary crowding. The patient (a student of dentistry) was aware of the progressive crowding of the front teeth of the lower jaw and wanted to prevent this process once and for all with the help of a CAD/CAM retainer. Unfortunately, the patient did not wish to correct the position of the teeth. In-situ image of the CAD/CAM retainer after bonding to teeth 33 and 43 by means of the transfer coping included in the scope of delivery. Perfect fit – 100% passive. Thanks to their perfect fit, CAD/CAM retainers can easily be placed in the ideal position in the patient's mouth even without the transfer coping that is included in the scope of delivery. 0.3 mm x 0.3 mm or 0.012" x 0.012" nitinol, electropolished.